*It was a bad week for Cumulus' WRKI (95.1 Brookfield CT), after a lightning hit on the station's tower knocked its main signal off the air last Saturday (June 14). Photos of the fire were the talk of the engineering community early last week, as the experts pored over the shots of flames erupting from the top of the tower and speculated on what happened. The answer, as it turns out, was a melting radome on the lower bay of the station's two-bay ERI rototiller antenna, and the result was a damaged antenna and a silent station. WRKI was back on the air at reduced power by Saturday night, and many listeners never even noticed the outage, since classic rock "I-95" reaches the southern half of its Fairfield County listenership by way of on-channel booster signals in Bridgeport and Norwalk. Unaffected by the lightning strike, those signals stayed on the air at full power - and we hear reception was actually a little better than usual in Stamford, where the boosters and the main signal usually interfere a bit with each other. Also silenced, at least briefly, was sister station WPUT (1510 Putnam NY), which has its studio-transmitter link on the tower. It was back on the air early last week, and WRKI returned to full power at week's end with a new antenna and transmission line. 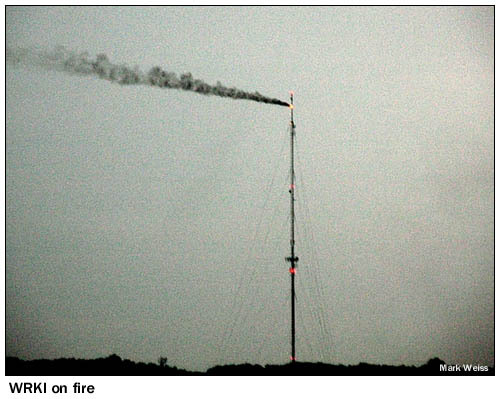 Alert readers may note that this is the second such burning FM radome in southwestern Connecticut in less than a year - last September, the antenna of WCTZ (96.7 Stamford) took a lightning hit and caught on fire as well. *Emmis has picked a PD for its New York rock outlet, WRXP (101.9). Leslie Fram comes north from Atlanta, where she's spent the last 17 years at Cumulus' WNNX (99.7 Atlanta), the last ten as PD before its "99X" modern rock format was moved off to an HD2 subchannel earlier this year. At WRXP, she replaces Blake Lawrence, the last remaining holdover from the station's previous existence as smooth jazz WQCD. The Sacramento-based religious broadcaster EMF is expanding yet again. Apparently not content with two networks that now boast nearly coast-to-coast reach, EMF last week flipped several of its "K-Love" and "Air 1" outlets in areas with overlapping signals to a new Christian country/southern gospel service it's calling "God's Country." One of the new network's first affiliates is in central New York, where EMF's purchase of several stations from Galaxy last year gave it duplicating Utica coverage for "K-Love." While the flagship network remains in place on WKVU (100.7 Utica), former simulcast WOKR (93.5 Remsen) is now one of about half a dozen "God's Country" outlets. At least when we heard it over the weekend, the new network was running automated, unlike the live talent on K-Love. Is this just a test market for EMF, or could the ambitious broadcaster, whose recent purchases have suggested almost limitless financial resources, be thinking about another round of station acquisitions to bring "God's Country" to more listeners? Meanwhile, Galaxy is selling a translator in the region: W248AN (97.5 Little Falls), which has been relaying WOUR (96.9 Utica), goes to Bud Williamson's Digital Radio Broadcasting for $5,000. Way up north, we caught the new 107.1 signal in Dannemora (west of Plattsburgh) on the air in its first weeks. Originally allotted to Saranac Lake, then to Saranac (another small town near Plattsburgh), another recent allocations shuffle moved this little class A signal to Dannemora, sending the as-yet-unbuilt 97.9 in the region from Dannemora to Au Sable. In any case, little 107.1 has changed calls from WDYC to WELX, and it's being leased by owner Randy Michaels (via his RadioActive, LLC) to serve as a simulcast of nearby WCLX (102.9 Westport). We noticed another AM-on-FM translator as we headed out of town last week: in Auburn, Finger Lakes Radio has flipped W251AK (98.1 Melrose Park) from a simulcast of WNYR (98.5 Waterloo) to a simulcast of news-talk WAUB (1590 Auburn). This is the second such AM-on-FM translator for the company, which also runs a translator for WCGR (1550 Canandaigua). Unfortunately, the 98.1 translator fights to be heard anywhere east of Auburn with another co-channel translator signal, W251AK (98.1 Nedrow/Lafayette), which relays WVOA (103.9 Mexico) from the tower of WSYT-TV, southwest of Syracuse. In Jamestown, Ray Hall's "Hall Closet" local talk program is history on WJTN (1240); as of today, its midday slot has been replaced by Ed Schultz. Where are they now? Bernie Kimble, who made a name for himself at Rochester's WMJQ and WCMF in the seventies, spent the last 13 years as PD at smooth jazz WNWV (107.3 Elyria OH), in the Cleveland market. Now he's departed that station, with no new plans yet announced. Matthew O'Shaughnessy made headlines two decades ago when, as a teenager, he took to the airwaves of his father's station, then WRTN (93.5 New Rochelle), as the host of a show called "Midnight Metal." He's back at the stations now, hosting two shows - a talk show called "Matthew's World" on Monday mornings at 11 on WVOX (1460 New Rochelle) and a new version of "Metal Mayhem" on Friday evenings from 7-9 on WVIP (93.5 New Rochelle). And we'd known Josh Lewin, who began his broadcast career calling games for our hometown Rochester Red Wings (he's also a fellow graduate of Brighton High School, a year ahead of your editor), was the TV voice of the Texas Rangers - but somewhere along the way, we missed his other gig, as the radio voice of the San Diego Chargers. He'll have a powerful new outlet for the broadcasts this fall, when the Bolts add Clear Channel's KLAC (570 Los Angeles) as an affiliate, reinforcing the team's status as the de facto local NFL team in a market that's long been without one. *A big PD vacancy in MASSACHUSETTS has been filled: Mike Thomas, who's already PD of WZLX (100.7 Boston), adds the same duties at sister station WBCN (104.1 Boston), where Dave Wellington exited a week ago. And while we have no doubt Thomas will do a fine job at WBCN, we can't help but think back to those days, a little over a decade ago, when what was then Infinity brought longtime competitors WBCN and WZLX under the same ownership. Mel Karmazin was running the group then, and he vowed that the stations would be kept strictly separate - different staffs, separate studios and all that. Progress marches on! Across town at WHDH-TV (Channel 7), it's the end of the line for general manager Randi Goldklank. She was suspended after that bizarre incident in April at Logan International Airport in which she was accused of drunkenly threatening several police officers; now she's entered a plea deal to charges stemming from that incident, and has resigned from WHDH. Former Channel 7 VP/GM Mike Carson continues to fill that post on an interim basis. Worcester's WCRN (830) has completed its studio move, vacating its old digs at 1049 Main Street for new street-level studios on the Common at 82 Franklin Street, just down the block from the Telegram and Gazette and the old studios of competitor WTAG (580). Out on the Cape, WOMR (92.1 Provincetown) is getting ready to launch a fundraising campaign to build out its new second service. 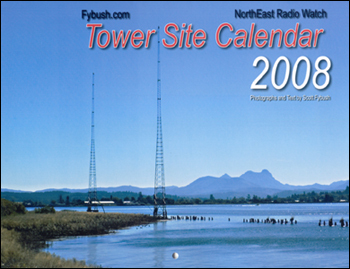 Lower Cape Communications was recently granted a CP for WFMR (91.3) in Orleans, and the Boston Globe's Clea Simon reports there's a target date of October 2009 for the new signal, which may carry some new programming in addition to simulcasts of WOMR's own programming. And congratulations to WARE (1250 Ware), which is celebrating its 60th birthday all summer. The station is broadcasting historical vignettes and doing prize giveaways through August, and it'll wrap up the celebration with a daylong party August 2 at Pulaski Park in Three Rivers, reports owner Marshall Sanft (aka Bruce Marshall). *In VERMONT, there are some changes on the way at WEZF (92.9 Burlington). PD Gale Parmelee has departed "Star 92.9," and we understand Steve Cormier is handling those duties for the moment until a replacement is named. Meanwhile, former Star middayer Jenny Foxx is on the way back to the station after spending the last year or so at WTNN (97.5 Bristol); she'll be working off-air until her noncompete expires later this year. *We can now put a price on Access.1's sale of most of its NEW JERSEY radio properties - the new Atlantic Broadcasting group is paying $9.5 million for WMGM (103.7 Atlantic City), WZXL (100.7 Wildwood), WTKU (98.3 Ocean City), WOND (1400 Pleasantville) and WTAA (1490 Pleasantville), plus Access.1's real estate in the market. That's a steep discount from what Access.1 paid just a few years ago, and we hear the company is now trying to sell its remaining properties in the market, primarily NBC affiliate WMGM-TV (Channel 40). There's a call change in South Jersey, too: WXXY (88.7 Port Republic) is now WGXM, calls last seen in the Dayton, Ohio market a few years back. *A PENNSYLVANIA newsman has resigned after accidentally carrying a loaded weapon into a courthouse. KDKA (1020 Pittsburgh) reporter Rob Milford was suspended after the incident last Monday, when he says he forgot that the gun was in his briefcase when he went through security at the Allegheny County Courthouse. But Milford also lacked a license to carry a concealed weapon, and by week's end he and KDKA had "come to a mutual agreement" on his departure. Across town at KQV (1410 Pittsburgh), they're mourning anchor Steve Lohle, who suffered a fatal heart attack at his Beaver County home Friday morning. Lohle's radio roots were in Massachusetts, where he started his career in the late sixties at WQRC (99.9 Barnstable), then moved to Springfield's WMAS (1450)/WHVY (94.7). He came to KQV in 1974 and had been there ever since. Lohle was just 58. There's another addition to the Ryan Seacrest syndication juggernaut: WAEB-FM (104.1 Allentown) picks up his LA-based "On Air" show for middays (noon-3), starting next Monday. That displaces PD Laura St. James to the 9-noon shift and music director Eric Chase to 3-7 PM, followed by "Grooves," who'll be voicetracking from sister station WIHT in Washington. Seacrest has also landed at Clear Channel's Harrisburg cluster, where he'll be heard in middays on "Kiss" WHKF (99.3), after the "Dave and Jimmy Show" from CC's WNCI in Columbus, Ohio. Mike Miller moves from mornings on Kiss to afternoons, while PD JT Bosch moves from afternoons on Kiss to afternoons on "Bob" country WRBT (94.9). Bosch also takes the PD role at WRBT as Joe Kelly exits. Former Kiss morning co-host Emily exits as well. There's a new signal on the air in Honesdale: Four Rivers Community Radio put WZZH (90.9) on the air last week, relaying the "Word FM" network from sister station WBYO (88.9 Sellersville) into the Scranton area. *Yet another AM station in CANADA is applying to vacate the band. CKDH (900 Amherst) is one of only a half-dozen or so AM signals remaining in Nova Scotia, and now it, too, wants to make the move to FM. It's applying to go to 101.7, reports the Halifax Chronicle-Herald; we'll have technical details for you once the CRTC releases them. We can now clarify some of the callsign confusion surrounding Moses Znaimer's classical signals in Toronto and Cobourg, Ontario: after initially applying to flip CFMX-FM (103.1 Cobourg) and CFMX-FM-1 (96.3 Toronto) to CFMZ and CFMZ-FM-1, respectively, then rescinding those new calls, they've settled on CFMZ for the Toronto signal and CFMX for Cobourg, reflecting the increasing split in programming between the two signals. On the TV side, CKXT (Sun TV) has been granted permission to shift its Ottawa DTV signal from channel 62 to channel 20, sharing an antenna with TVOntario. Add another to the list of job openings for talk hosts in MASSACHUSETTS - and this one's an especially sad one. As he continues to recuperate from his fourth brain surgery in less than three years, WBZ (1030 Boston) evening talk host Paul Sullivan announced last week that he's giving up the shift, which he inherited after the death of David Brudnoy in 2004. In a letter to his listeners and colleagues, Sullivan wrote, "The toll my surgeries and treatments have taken on me makes it unlikely that I will ever have the energy to return to a four-hour daily talk radio program." He'll return to WBZ this Thursday night for a final "farewell" show, and he says he'll continue to be a presence on the station as much as he's able, whether through commentaries, website postings or occasional guest-hosting stints when he's feeling up to it. In MAINE, the movement of Citadel's WCYI (93.9 Lewiston) and WCLZ (98.9 Brunswick) into a trust pending sale meant a change of simulcasts last week: WCYI is now rebroadcasting the AAA sounds of WCLZ, instead of the modern rock of WCYY (94.3 Biddeford), which remained with Citadel. One exception to the simulcast: WCYI is carrying the Opie & Anthony morning show, while WCLZ isn't. The Law of Program Director Conservation was in full play last week in NEW YORK. At CBS Radio's revived WXRK (92.3), the PD chair last occupied by John Mainelli (before the abrupt demise of "Free FM") was filled by Tracy Cloherty, a familiar name in Big Apple programming circles. Cloherty was PD of Emmis' WQHT (97.1) for many years, before retreating to a consulting role, and now she'll trade rap for rock as she moves uptown to K-Rock. Meanwhile downtown at Emmis, WRKS (98.7) lost its PD. Toya Beasley, who's been with Kiss since 1989, and its PD since 1997, is - you guessed it - dropping back to a consultancy with the station. No replacement has been named yet. The big news from PENNSYLVANIA is all about signal upgrades, starting with Greater Media's WJJZ (97.5 Burlington NJ), which flipped the switch last week on its new class B signal from the Wyndmoor tower just north of Philadelphia. It's now a 26 kW/682' signal with a directional notch to the northwest protecting WRVV (97.3 Harrisburg), and early reports suggest a much better signal in center city Philadelphia than 97.5 enjoyed from its old site in Trenton. Nobody ever said working in radio was a stable career path - but last week was a particularly treacherous one for radio people all over NERW-land. We'll start in NEW YORK, where WCBS-FM (101.1) broke even more dramatically from its long run as "WABC, Continued" - by parting ways with Dan Ingram. 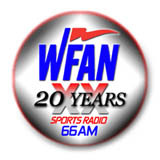 The WABC veteran had spent the last 12 years doing weekends on WCBS-FM - but when CBS-FM PD Joe McCoy came to him and asked him to give up the Saturday half of his shift to Dan Daniel, Ingram said no, and CBS-FM said "sayonara." But if Ingram's crying in his "Tri-Fi Drums," he'll have plenty of company this week. Out on Long Island, talker WLIE (540 Islip) had some cost-cutting to do as well, axing Lynn Samuels from its weekend schedule - and, says Samuels on her Web site - cutting morning news anchor Tracy Burgess and midday talk host John Gomez from its schedule as well. But wait - there's more. Over at Barnstable Broadcasting's Long Island cluster, operations manager Bill George was shown the door amidst a staff shuffle that moved Bill Edwards (longtime PD of WALK) from afternoons on WLVG (96.1 Center Moriches) to PD/afternoons on "K-JOY" WKJY (98.3 Hempstead), replacing Scott Miller - who heads out to WLVG for afternoons. Still more? If you're a fan of shock talk radio, there is: WABC (770) pulled Michael Savage's Talk Radio Network show off its evening schedule, apparently as part of a dispute between Savage and ABC that began when ABC's KSFO (560 San Francisco) declined to meet Savage's contract renewal demands. Weekend guy Mark Levin is filling in on WABC's evening shift. Big doings in CANADA: Rogers is moving the "Mad Dog and Billie" morning show, last heard on CISS (92.5 Toronto) when it was still "Kiss," up the dial to CHFI (98.1), which gets a slightly harder musical edge as well. And yes, that means more personnel changes: CHFI's morning team of Bob Magee and Erin Davis splits up, with Magee (who did the CHFI show solo last week) moving over to CISS under its new "Jack" identity and Davis being shown the door. On her Weblog, Davis says she's taking some time off and visiting family in British Columbia while figuring out what to do next.